On Aug. 21, the Catholic Church celebrates the feast day of Pope Saint Pius X, known for opposing doctrinal errors, promoting frequent Holy Communion, and initiating liturgical reforms during the early 20th century. Giuseppe Melchiorre Sarto was born June 2, 1835 in the Italian town of Riese near Venice. He was the oldest of eight children born to Giovanni Sarto, a postman, and his wife Margherita, a seamstress. 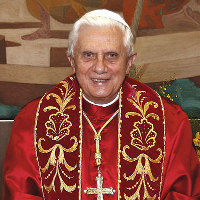 His humble family background gave the future Pope a lifelong appreciation of poverty and simplicity. A local priest instructed Giuseppe in Latin, and a scholarship enabled him to attend high school in a nearby town. His parents encouraged their son’s discernment of a vocation to the priesthood, and he received a second scholarship to enter the seminary in Padua during 1850. Ordained in 1858, Father Sarto served as a parish priest in a poor area of the Trentino district, assisting a pastor who observed his pastoral gifts and predicted his rise within the Church. In 1867 he became a pastor in the Treviso diocese, where he was known for his charity and sound teaching. Nine years later he became chancellor of the diocese, canon of its cathedral, and rector of its seminary. Alongside these responsibilities, he devoted time to instructing children in their faith, giving special attention to public school pupils who received no religious formation in the classroom. In 1884, Pope Leo XIII appointed Canon Sarto as Bishop of Mantua. As a bishop, he worked to reform the troubled diocese, urging its priests to embrace their responsibility to communicate the truths of the faith. He continued to lead by example, personally undertaking the work of religious instruction. Made a cardinal and named Patriarch of Venice in 1893, he demonstrated his customary care for the poor and attention to the teaching of the faith. But Cardinal Sarto had no expectation of becoming Pope after Leo XIII died in 1903, nor did he want to assume the responsibility. Against his own wishes, however, he was chosen as Leo’s successor, taking the name of Pius X. His motto, “To restore all things in Christ,” was implemented with a focus on priestly formation, instruction of laypersons, the revival of traditional sacred music, and the Church’s liturgical and sacramental life. 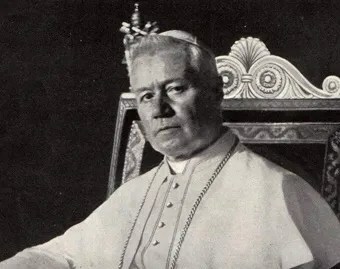 While his reforming efforts bore fruit among the faithful, Pope Pius X was distraught over his inability to prevent the coming World War, which he is said to have predicted as a catastrophe for civilization and the Church. He died on Aug. 20, 1914, only weeks after the war began. 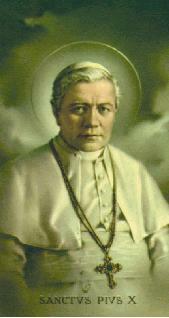 Beatified in 1951, St. Pius X was canonized in 1954. 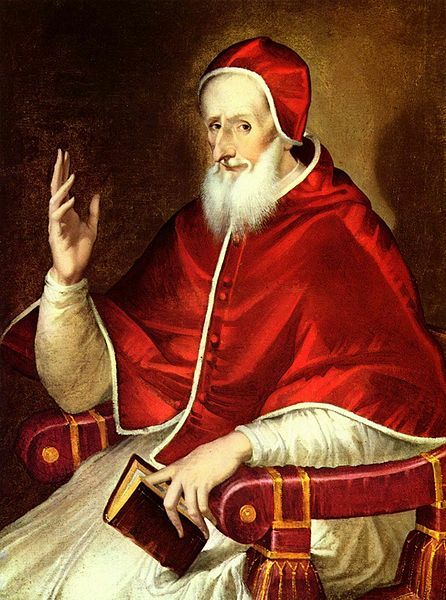 He was the first Pope to be declared a saint since the 1712 canonization of the 16th century Pope St. Pius V.
Glorious pope of the Eucharist, St. Pius X, you sought “to restore all things in Christ.” Obtain for me a true love of Jesus so that I may live only for Him. Help me to acquire a lively fervor and a sincere will to strive for sanctity of life and that I may avail myself of the riches of the Holy Eucharist, which is sacrifice and sacrament. By your love for Mary, mother and queen, inflame my heart with tender devotion to her. Blessed model of the priesthood, obtain for us holy, dedicated priests, and increase vocations to the priesthood and religious life. Dispel confusion, hatred, and anxiety. Incline our hearts to peace so that all nations will place themselves under the reign of Christ. Amen. St. Pius X, pray for me. Sáncte Míchael Archángele, defénde nos in proélio, cóntra nequítiam et insídias diáboli ésto præsídium. This entry was posted in Devotion, Saints. Bookmark the permalink. Clearly not a man to be trifled with. It should be all our prayers that the SSPX be reconciled with Holy Mother Church. It is their wish, it is the Holy Father’s wish and it must be our wish. I do not feel there is anything unfortunate in their choice of name. St. Pius X was a great Pope, and the SSPX’s stance against excess Modernism will ultimately bear fruit. This must be our prayer. There’s something odd, and somewhat meaningless, about protesting “excess Modernism,” thinks Toad. It’s a bit like protesting that we are now in the year 2012. Inevitable, he thinks. He’s probably wrong, of course. We can no more help being modern than Toad can help being old, in 2012. Fact of Life. The truth is though I personally have found not for the first time, when mentioning in conversation with other Christians (not necessarily just Catholics) the name of this holy pope, St. Pius X, many immediately jump onto the subject of the SSPX. In fact this happened just the other day to me when I and a group of friends were discussing the errors of Modernism in today’s world. It is frustrating, and I feel St. Pius X’s tireless and worthy fight against Modernism is being overlooked by this. 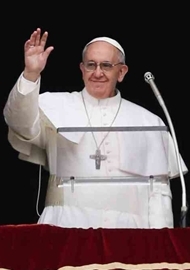 But perhaps it is for this very reason that his name should be associated with an association that has remained faithful to Catholic Tradition! Thanks, but no thanks. Conciliar Rome needs to convert to the genuine Catholic faith, renounce ecumenism and religious liberty and take the antimodernist oath. The SSPX clings to dear Holy Tradition and will preserve the true True, the Mass of the Ages, the Tridentine Mass. The reconciliation didn´t come – and we can only say “Deo gracias!” For if it had come, surely the SSPX would be forced to embrace that what made their founder separate himself from them: Heresy! The SSPX is not to follow mainstream Catholicism of modern age, it would be like participating in cutting again the head of St. John the Baptist! Same procedure, same accusations – modernism in all aspects! No to Vatican Council II and all it´s reforms. It was just a pastoral council, and Catholics aren´t bound to follow it. Homily for Easter Day - Archbishop Fulton Sheen.